Whats it like to be a part of the pit crew during the 24 Hours of Le Mans? "That's why you're here, really. Free labour!" someone jokes. You see, it's time for the Qualifying during the 24 Hours of Le Mans, and it's a rather cold and windy Thursday. Lucky for me, then, that I'm comfortably ensconced in a pair of overalls of a powder blue and orange hue. Sound familiar? Yes, it's a thoroughly evocative livery - one that at once brings to mind the long-tailed Porsches 917s, those terrific Ford GT40s and now a fleet of Aston Martin Vantages. It's a livery that every motorsport fan wants to see up close. It's a livery that every endurance racer would like his car to be painted in, and it's a livery that every team mechanic would like to sport. Today, I am in the Gulf Aston Martin team overalls. The Gulf Aston Martin team has very kindly agreed to let us be part of its pit crew. Of course, they wouldn't want me mucking about and getting in the way during the race itself, so I am asked to help out during the qualifying. Our cameras are taken away from us  - after all no proper mechanic wanders around with a camera. And off we're sent to learn what it takes to be a part of the pit crew. I'm assigned to the No 95 GTE Am car that's being piloted by Allan Simonsen, Christoffer Nygaard and Kristian Poulsen. It's the only all-Dutch team, if you exclude me that is, considering I'm now a part of the the crew. I'm assigned to work on tyres, and so Conrad Porter who is in charge of all tyre operations for the No 95 car leads me around back, past the tyre warmers to a small area where used tyres are brought after each session. Now every time a set of tyres is used during any session of Le Mans, the team takes them off, has them cleaned and then sets them aside for use later. Why is it important to make sure that the rims of the tyres are spotless? Because the slightest bit of dirt on the rims will upset the balance of the car. And we wouldn't want that, now, would we? The tyres are all stacked up in order on contraptions called tyre chickens (no one was able to tell us why they were called chickens, though). Right on top is the front left tyre, with the front right tyre below that, and the rear left and rear right tyres at the bottom. 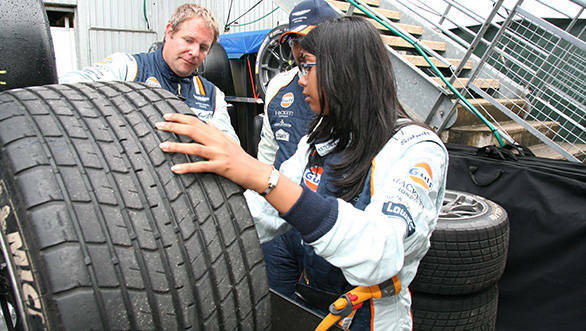 The order, of course is of utmost importance as the tyres aren't meant to be swapped around. Conrad looks friendly enough, but I decide I wouldn't want to test his patience by mixing up the tyres and memorise the pattern at once. I'm assigned one tyre chicken with four tyres on it that I'm meant to scrub, hose and stack up once again. There's no time to waste - my tyres need to be ready before the No 95 car is back in the pits for a driver change. Best get to work, then! At 20kg, these tyres are light. Ahem! As I discover though, carrying tyres around isn't the easiest of tasks. "Tyres in Formula 1 are light," Conrad looks at me as if sizing me up. "These however," he continues as my knees buckle beneath me "weigh 20 kg each". With considerable effort, and some help from a kindly soul nearby, I manage to ensure the tyre reaches the tub. With the tyre standing upright, I'm given a scrub and some soapy water, and told to scrub away. It's a lot like washing dishes really, although you look a lot cooler and feel a lot fancier too, I'll give you that. Once the scrubbing is done, I hose the tyres down with the spray. One down, three more to go. As soon as I'm finished with them, the tyres are whisked away quickly to be put onto the No 95 car once again. "Time to check the tyre pressures, now," Conrad tells me, before ushering me into the garage. 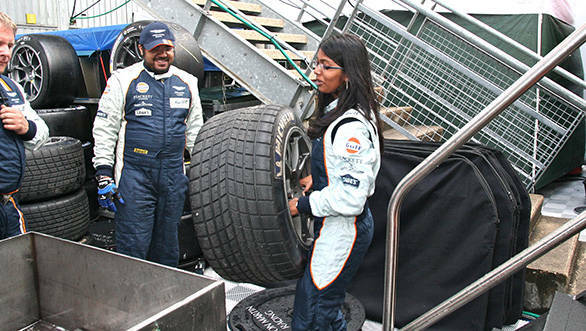 In this case, I only observe as he quickly checks the tyre temperatures, consults with their in-house Michelin specialist and then relays the information back to the crew. It doesn't seem like there's too much else for me to do in this department, so I'm quickly sent off, with a bottle of cleaning spray and some tissue to start cleaning the car. Cleaning the car, as I'm informed, is a very important task. Every time the car leaves the garage it is meant to be spotless - important for the fans to see a shiny racecar, for the team itself and of course for their sponsors as well. So off we go, spraying the car down and scrubbing the dirt away. In the midst of this process, driver Christoffer Nygaard arrives to have his seat cushioning added into the car. Joe Roberts, Driver Assist for the No 95 car, comes along and tells me to have a quick word with Nygaard. Well, why not! Resisting the impulse to ask him whether he thinks his car is the shiniest of the lot, I quickly ask what he thinks of their chances at pole. "We are looking good, the car is running well all weekend and we think we have a good chance," Nygaard says. Turns out he's right. The No 95 Aston Martin is on pole in the GTE Am category. It's all down to those squeaky clean tyres I tell you. You'll have to excuse me now, it's time for us mechanics to go take a coffee break.